It's a bromance gone awry. An internecine feud involving whistle-blower complaints, allegations of financial malpractice, abdication of fiduciary responsibilities, a patriarch who refuses to quietly walk away into the sunset, a divided board, external and internal turmoil, executive exits, angry denunciations and power grab. The goings-on at India's second largest IT service exporter would make for a splendid soap opera plot line. Often called iconic, the industry's bellwether and many such sobriquets, Infosys is facing an unprecedented crisis after its first non-promoter CEO and MD of the company, Vishal Sikka, resigned over what he called "false, baseless, malicious and increasingly personal attacks amplified by the very people from whom we all expected the most steadfast support"
The accusations were around alleged kickbacks received and paid, nepotism, extravagant expenditure and high-handedness. Besides, there were conflict about the strategy and way forward for the company, as well as trust issues between the management and the promoters. The "people" Sikka made an oblique reference to were the promoters who had built the company for the first three decades of its existence. Nobody saw this coming in April 2014 when Founder and Chairman Emeritus N.R. Narayana Murthy announced Sikka's hiring. It was seen as a match made in heaven. Sikka, with his phenomenal product development success at global enterprise software major SAP, was seen as the perfect candidate to help Infosys transition from being a low-end player - but till then, lucrative - in the services sector. The $3 trillion IT services market was undergoing a seismic shift with automation and Artificial Intelligence commoditising a large chunk of the market. The shift to digital and cloud meant that Infosys and Indian IT had to reinvent themselves. Sikka was seen as the much-needed driving force for the company to make this transition. Sikka's lack of familiarity about the services market proved to be both a blessing and a curse. Blessing, as he was open to experiments, including investing in design thinking, making acquisitions, building IP and platforms, eliminating thousands of jobs in commoditised segments like application maintenance, testing and package implementation. However, being new to the company that had a strong culture, he rubbed several senior executives, who had helped build the company, the wrong way. While he succeeded in ousting most of the dead wood from the company, his move to hire several of his ex-SAP colleagues in senior roles, at 'high' salaries was seen as nepotism. 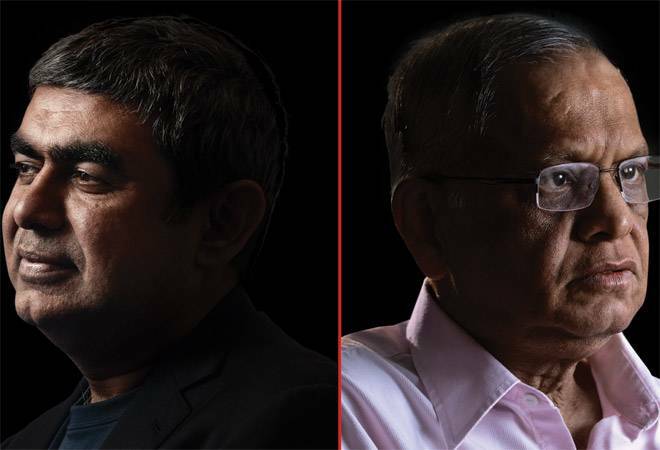 Perhaps the biggest mistake that Sikka made was not keeping on the right side of the promoters, especially Murthy, whose influence in the company belies his shareholding. Murthy and his family own only 3.44 per cent stake in the company, while the promoters collectively own about 12.76 per cent, but Sikka was never able to or allowed to outgrow his shadow. Sikka also made the cardinal sin of publicly announcing targets - $20 billion by 2020 and $80,000 in revenue per employee - without fully doing his homework. As he pointed out in a media conference after his resignation announcement, Infosys, under his 40-month reign, regained the title of 'fastest growing company' with the highest margins. He also pointed out that revenues grew from $2.13 billion in the quarter he took charge to $2.65 billion in the latest quarter. Infosys' cash chest grew from $4.9 billion to $6.1 billion despite dividend payouts amounting to Rs 20,000 crore and several acquisitions. However, this drama was never about growth or lack thereof. The acquisitions especially of Panaya, an Israeli cloud-based enterprise application company, proved controversial. There were allegations of an inflated price tag paid and kickbacks involved. Sikka's move to spend money in leasing expensive real estate in the US also came under the scanner, apart from the occasional jet hired to fly him around. When anonymous whistle-blower complaints surfaced, Murthy - who had been annoyed at Sikka's several sins of 'omission and commission' - used the occasion to question the company's corporate governance standard. The board was accused of having abdicated its fiduciary responsibilities to shareholders. Despite two 'independent' probes by 'external' parties giving a clean-chit, the broken mirror of trust between Sikka and the promoters could not be mended. Constant questions about motives and allegations finally drew Sikka to throw in the towel, in spite of his steely resolve to "stay and fight" like a "kshatriya warrior". While the board was earlier perceived as being soft and supportive of Sikka, it seems to have hardened its stand against Murthy - at least a majority, if not the entire board. It has accused Murthy of being a bully who forced Sikka's resignation and being factually incorrect, dashing hopes of a quick reconciliation. It has also indicated that it would not welcome him back on the board. Despite its size, track record and excellent balance sheet, Infosys may find it hard to attract any well-respected industry professional to fill in Sikka's shoes. An insider may not be able to bring in the kind of radical changes the company needs to sustain its leadership. The promoters also need to realise that they are damaging, perhaps even destroying, their creation - a company that has 2,00,000 employees. While Infosys co-Chairman Ravi Venkatesan denied that he was in the race, the company needs to find a suitable replacement soon. Somebody like Nandan Nilekani, who was one of the most successful CEOs of the company, a promoter who till now has, at least publicly, maintained his cool, might be a good choice. But will he take up the challenge? With key markets such as the US and the UK becoming more challenging, owing to tougher policies, time is of the essence for the Indian IT industry. Instead of indulging in internal feuds, Infosys needs to regain its title of being a pioneer. Its customers, employees, investors, competitors and other stakeholders are watching closely.